Happy Thanksgiving! 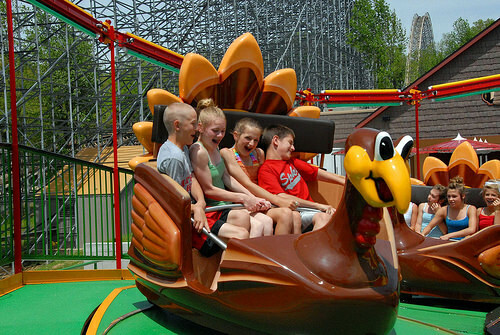 You can celebrate again this spring at Holiday World in Santa Claus, Indiana, by going for a spin on their turkey-themed Tilt-A-Whirl ride. The world’s first and only Turkey Whirl was custom-made in 2007 for the holiday-themed park. “Do you watch carefully for the first robin of spring each year?” says their blog. “Here at Holiday World, it’s the first turkey of spring that makes our hearts leap with joy!” The park opened as Santa Claus Land in 1946 and later added sections with rides and entertainment inspired by Halloween, Thanksgiving, and the Fourth of July, as well as roller coasters and a water park. Holiday World and Splashin’ Safari opens April 25. I watched the video – the squeals of the kids almost sound like gobble turkeys! Happy Thanksgiving ATZ! Thank you for all your fine work.